Young He '19 has competed in more than thirty competitions. 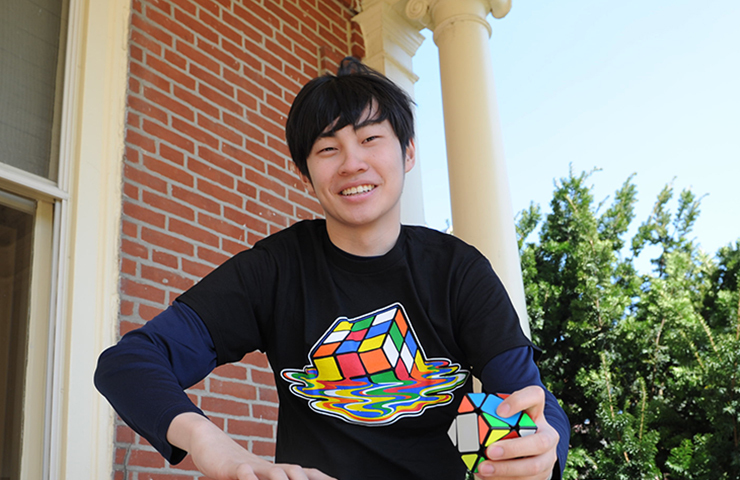 He holds two gold, four silver, and four bronze medals from the World Cube Association. More than one hundred opponents from six countries will compete in an intense eight-hour match at the George School Open 2019, and official World Cube Association event on Saturday, May 11, 2019. Competition will be fierce, but the players probably won’t even break a sweat. They will be solving one of the most puzzling puzzles of all time, the Rubik’s Cube. The competition begins at 9:00 a.m. in the George School Fitness and Athletics Center, South Gym. Young has competed in more than thirty competitions including the Yangzhou Open 2017, the Shanghai Spring 2017, the Taiyuan Winter 2018, the Dunwoody Day Bash 2019, and the Princeton Winter 2019. He holds two gold, four silver, and four bronze medals from the World Cube Association. The George School Open 2019 will feature challengers of all ages representing India, China, Turkey, Korea, the United Kingdom, and the United States. It’s the first match for thirty of the one hundred opponents. The event begins at 9:00 a.m. on Saturday, May 11, 2019 in the FAC Multipurpose Gym. Awards will be given at 6:00 p.m. after the completion of all event rounds. Spectators are welcome and the event is free and open to the public.